*This post originally appeared on the Disaster STS network by SRL member Max Liboiron. Last week, a coalition of of Hurricane Sandy survivors, Faith New York, Make the Road New York, Alliance for a Just Rebuilding, and several NYC councilmembers delivered a report to New York City Mayor de Blasio on the front steps of City Hall. 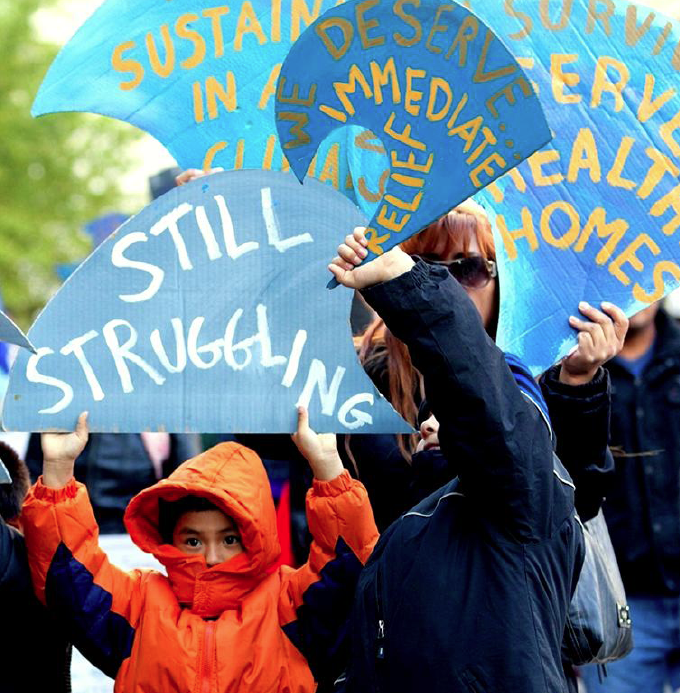 The report, “How Sandy Rebuilding Can Reduce Inequity in New York City,” highlighted how the effects of Hurricane Sandy are escalating, rather than diminishing, for many survivors. One of the people who delivered the report was Davon Bennett, a young man from Far Rockaway, Queens. He addressed the crowd on the steps: “In the process of repairing our house, my parents have depleted their savings, their retirement account, and my college fund. Now after waiting sixth months for help from the Build it Back program, the city is telling us we need to raze our home.” Bennett’s experience is a personal portrait of the data in the report, which draws on Sandy Tracker to evaluate the failure of several recovery projects: Build it Back, the city’s main housing recovery program, has awarded less than one percent of applicants for single family homes have received an award, and none have started construction. Only 3 of 1,051 registrants to the Multi-Family Building Rehab program have begun repair work nearly two and half years after Sandy hit New York City. 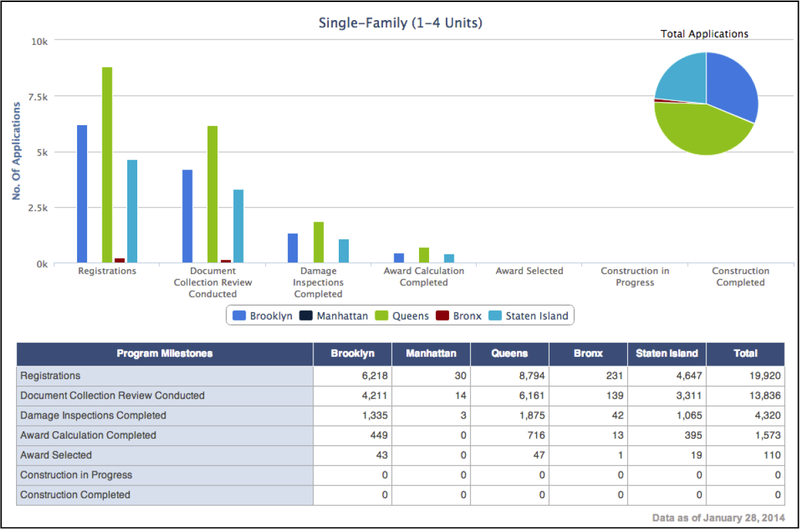 NYC Sandy Funding Tracker, Multi-Family Building Reconstruction, Program Milestones as of January 28, 2014. DeWolfe, D. J. (2000). Training manual for mental health and human service workers in major disasters. These stories and data counter the traditional view of the temporality of disasters. The image above is was first published* in a Training Manual for Mental Health and Human Service Workers in Major Disasters published in 2000, and is currently used by the Center for Disease Control and various crisis counseling services for disaster survivors. Yet, rather than a teleological climb back to normalcy, there are two ways that many on-the-ground experiences of Sandy create a different temporal pattern. First, people who were relatively resilient and able to deal with adversity before the storm are now vulnerable. Secondly, for populations that were already vulnerable due to poverty, lack of access to health care and education, and precarious employment or housing, not only are they in increasingly dire situations, but a return to “predisaster” normalcy can hardly be called a recovery. I’m working with Sandy survivors, grassroots and community-based groups, and some other researchers to find alternative timelines to define the aftermath of Hurricane Sandy as the disaster deepens for many survivors. From “How Sandy Rebuilding Can Reduce Inequality in New York City” (2014).